TUSCALOOSA, Alabama -- Country superstars Alabama wasted no time reeling off their high-energy hits for the capacity crowd at their benefit reunion concert at the Tuscaloosa Amphitheater Friday night. "If You're Gonna Play in Texas (You Gotta Have a Fiddle in the Band)," "Tennessee River," "Dixieland Delight" and "Song of the South," the first songs of the set, got people on their feet and singing from the first note of the night. 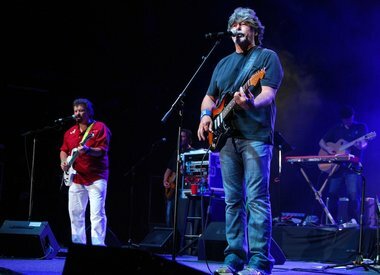 After getting the crowd going, the band began to mix in the ballads, and lead singer Randy Owen took several opportunities to speak about the purpose of the evening: to make a difference in the state of Alabama.